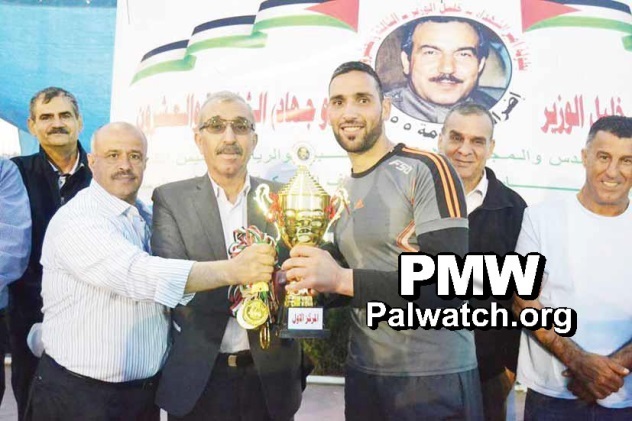 “Under the auspices of the Fatah Movement’s Hebron branch, the Shabab Taffuh Sports Club organized the [former PLO Chairman and PA] President Martyr Yasser Arafat Football Championship for the 14th anniversary of Yasser Arafat’s death. [The championship was held] at the fields of the Taffuh High School for Boys, with the participation of 11 teams of children and youth. Headline: "The occupation banned the holding of a football championship in Jerusalem named after Martyr Abu Jihad"
"The Israeli occupation authorities today, Thursday [May 3, 2018], published an order signed by the occupation's [Israeli] Minister of Public Security extremist Gilad Erdan, that bans the holding of a football championship in Jerusalem named after Martyr (Shahid) 'Abu Jihad' [Khalil] Al-Wazir (i.e., terrorist responsible for murder of 125). 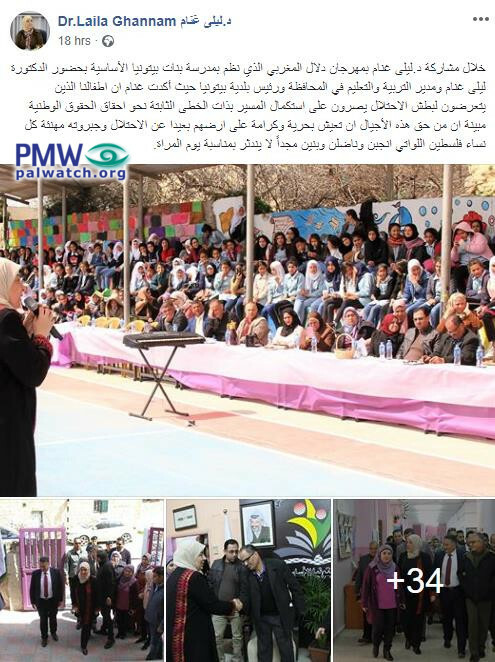 It should be noted that this championship has been held in the city every year for the last 24 years, and it was supposed to take place tomorrow, Friday, at the sports field of the Silwan school in the Ras Al-Amud neighborhood, south of the Al-Aqsa Mosque." Abu Jihad (Khalil Al-Wazir) - a founder of Fatah and deputy to Yasser Arafat. He headed the PLO terror organization's military wing and also planned many deadly Fatah terror attacks in the 1960’s - 1980’s. These attacks, in which a total of 125 Israelis were murdered, included the most lethal in Israeli history - the hijacking of a bus and murder of 37 civilians, 12 of them children. The images show the championship event in which the families of terrorist prisoners were honored. 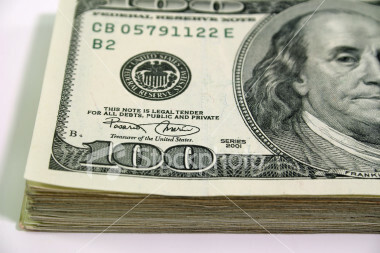 In the second image a stack of honorary posters are seen prior to being distributed to the family members. The cover image of the photo album in this Facebook page shows a poster of the championship. 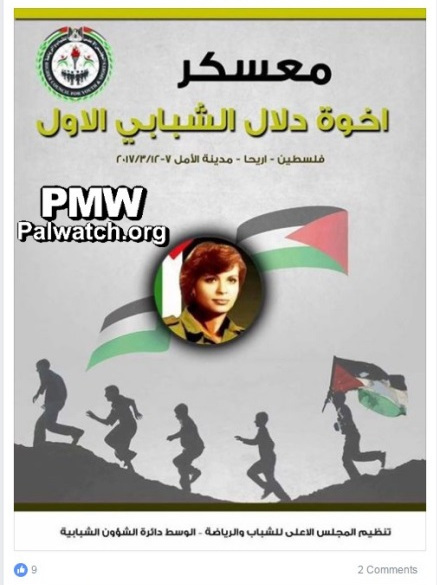 At its top is the Fatah logo that includes a grenade, crossed rifles, and the PA map of “Palestine” that presents all of Israel as “Palestine” together with the PA areas. On the right is a picture of arch-terrorist Abu Jihad. 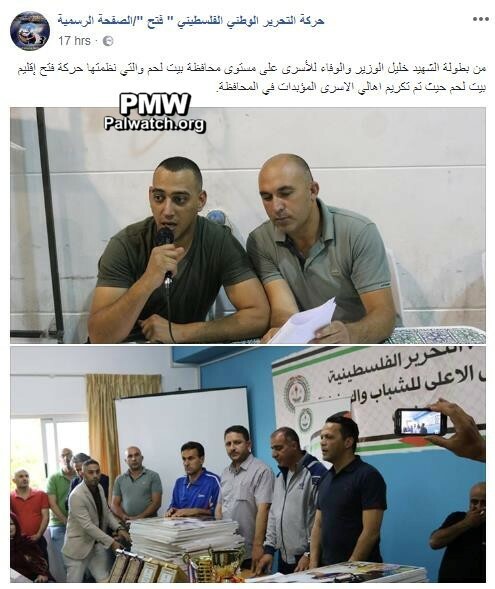 The images show Fatah honoring the family members of terrorist prisoners from the Bethlehem district who are serving life sentences. 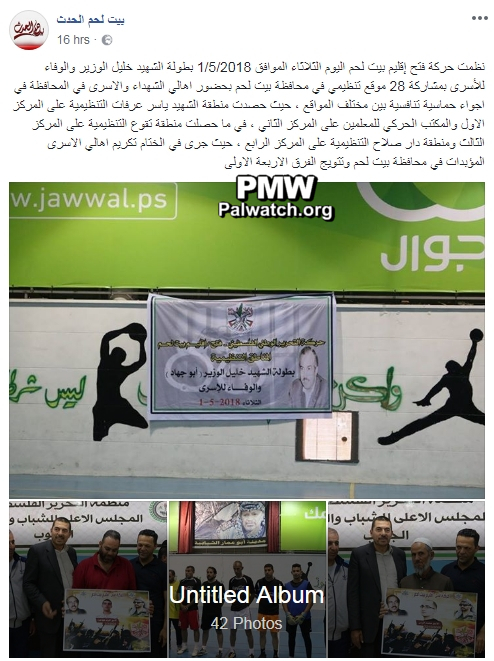 Student union at Al-Quds Open University holds "The Prince of Martyrs Khalil Al-Wazir 'Abu Jihad' Tournament"
According to the names of the teams participating (not translated) the cups will take place in Gaza. The article includes a picture of the team that won the championship, whose members are seen wearing medals around their necks and posing with a sign featuring a picture of terrorist Raed Al-Karmi holding an assault rifle. 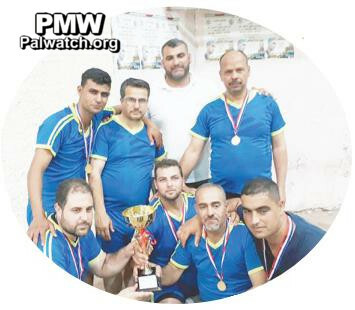 Palestinian Football Association supervises the 23rd annual "Prince of Martyrs Abu Jihad Football Championship"
Headline: "The Mount of Olives [Sports Club] won the Prince of Martyrs Abu Jihad Championship, and the Al-Nasser [Club] is its runner up"
"The Jerusalem Al-Nasser [sports] club has successfully organized the Prince of Martyrs (Shahids) Khalil Al-Wazir (i.e., terrorist, responsible for murder of 125) Championship for the 23rd consecutive year… with the participation of 12 Jerusalem clubs. This is under the supervision of the central branch of the [Palestinian] Football Association and under the joint auspices of the central branch of the [PLO] Supreme Council for Sport and Youth and the Jerusalem Clubs Association." Abu Jihad (Khalil Al-Wazir) - was a founder of Fatah and deputy to Yasser Arafat. He headed the PLO terror organization's military wing and planned many deadly Fatah terror attacks murdering 125 Israelis. This included the most lethal in Israeli history, the hijacking of a bus and murdering of 37 civilians, 12 of them children. Palestinian Football Association supervises 23rd annual "Prince of Martyrs Khalil Al-Wazir [Abu Jihad] Championship"
"The Jerusalem Al-Nasser club has successfully organized the Prince of Martyrs (Shahids) Khalil Al-Wazir (i.e., terrorist, responsible for murder of 125) Championship for the 23rd consecutive year... with the participation of 12 Jerusalem clubs. This is under the supervision of the Central Branch of the [Palestinian] Football Association and under the joint auspices of the Central Branch of the [PLO] Supreme Council for Sport and Youth and the Jerusalem Clubs Association." Maysara Abu Hamdiyeh - Hamas member who was serving a life term for recruiting and training terrorists, preparing explosives for suicide bombings, attempted murder, and possession of weapons. Died of cancer while being treated at the Israeli Soroka Hospital in April 2013. Headline: "How did Hilal Al-Quds express solidarity with the Lion of Jerusalem, Martyr Musbah Abu Sbeih?" 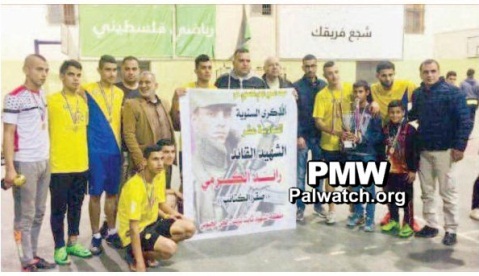 The article includes a picture that shows the Hilal Al-Quds football team holding a banner honoring Palestinian terrorist Musbah Abu Sbeih, who murdered 2 Israelis and wounded 5 others in Jerusalem on Oct. 9, 2016. 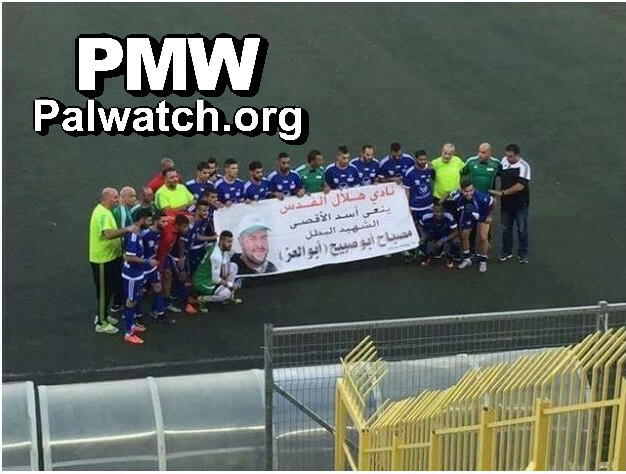 Text on banner: "The Hilal Al-Quds Club mourns the Lion of Al-Aqsa, Martyr (Shahid) Musbah Abu Sbeih 'Abu Al-Izz'"
After this picture was posted online, on Oct. 11, 2016, the coach of the East Jerusalem Hilal Al-Quds soccer team, Maher Abu Sneineh, was arrested by Israel on charges of conspiracy to commit a crime and public support of terror. Musbah Abu Sbeih – 39-year-old Palestinian terrorist who murdered 2 Israelis and wounded 5 others in 3 drive-by shooting attacks in Jerusalem on Oct. 9, 2016. Abu Sbeih, who held Israeli residency status, began his shooting spree at the Ammunition Hill light rail stop and continued to the Shimon Hatzadik neighborhood. He was killed in an exchange of fire with Israeli border police officers during the attack. On the morning of the attack, Abu Sbeih was due to turn himself in to begin a 4 month jail sentence, after being convicted in January 2015 on numerous counts of inciting to terror and supporting a terror organization. On his Facebook page, Abu Sbeih praised terror groups including Hamas as well as terrorists who carried out attacks and actively called for attacks against Israelis. In July 2016, Abu Sbeih was given a distancing order from the Temple Mount that was to be in effect until the end of October 2016. Yasser Dhiab Hamdouni – was serving a life sentence for participating in the murder of Israeli citizen Avner Maimon in the Palestinian town of Ya'abad in the West Bank (June, 12, 2003). Hamdouni, a member of the Al-Aqsa Martyrs’ Brigades (Fatah’s military wing), died on Sept. 25, 2016, after collapsing while exercising in the Israeli Rimon Prison yard.